Rebecca's fibromyalgia had become so severe that it forced her to leave behind a successful career as a registered nurse. 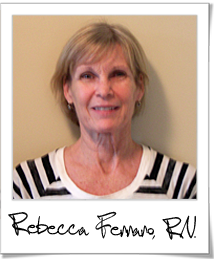 Concerned that the long list of prescription medications and steriod injections weren't helping her at all, Rebecca's husband urged her to make an appointment to see Dr. Huntsman. With the treatments that Dr. Huntsman personalized just for her, Rebecca has left her old fibromyalgia life behind, and is experiencing the joys that life can truly bring. "Prior to seeing Dr. Huntsman at Georgia Clinic of Chiropractic for my condition, I used to have “flare-ups”, often with fatigue that limited my activities, my sociability, etc. I would also have dizziness, headaches, sinus problems, back pain, neck pain and arm pain. Before seeing Dr. Huntsman I had tried steroids and medications, but they had little to no effect on the pain. It was because of my health condition that I left my professional career, and it caused an inability to exercise, and I became more withdrawn. I had really lost any confidence that I would ever be pain-free and returning to the very active lifestyle I had prior to my condition. At my husband’s insistence I made an appointment to see Dr. Huntsman. After all, what did I have to lose? Now because of Dr. Huntsman’s care, I no longer consider my pain chronic, and all the symptoms I used to have are now very much improved. I’m sleeping better now, I’m more social, I have more energy, and I can increase my physical conditioning exercises now with little limitations. My irritability has also gotten better and the need to be alone has decreased. I have recommended several people to Georgia Clinic of Chiropractic and those that have come are very pleased with their own results in a short period of time."